As football season approaches, the kitchen chicks are in the kitchen preparing some easy and delicious recipes to help make the game enjoyable even if our team doesn’t win. I’ve always wanted to make sliders and this it’s-so-easy-it’s-embarrassing recipe for ham and cheese sliders hits all the right spots at the chicken coop. Here’s everything you’ll need to impress your friends and fill them up at the same time. Open the package of King’s Hawaiian rolls and slice them down the middle. Don’t break them apart. Put the bottom side of the rolls into a 9X13 pan. 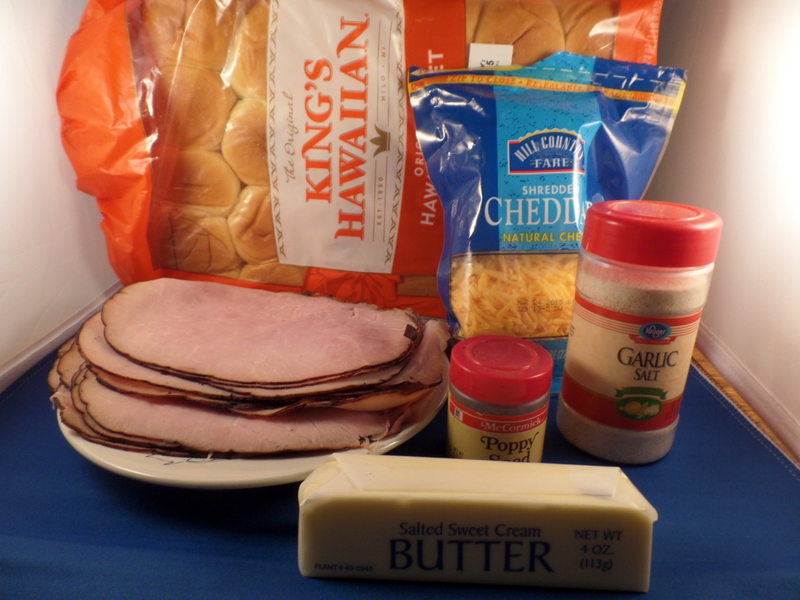 Layer the ham on top of the rolls and sprinkle the cheese all over the ham. Put the tops of the rolls on top of the ham and cheese. Add the other ingredients and stir a bit. Drizzle the butter mixture over the tops of the rolls until completely covered, brushing with a pastry brush to cover the tops evenly. It’s ok to let the butter go into the cracks. Sprinkle poppy seeds over all. Cover with foil and place in a 375 degree oven for about 15 minutes. Uncover and bake an additional 5 minutes on the top rack to brown the rolls and make the cheese all melty. Remove from oven and let cool slightly (5 minutes or so) and then go around each roll with a very sharp knife to cut through and separate the buns. Serve with chips and other party foods. This was very well received by the roosters in the coop and even made for excellent lunches the next day. These slides are great for parties as an appetizer or main dish. Kids love them too! Open the package of King's Hawaiian rolls and slice them down the middle. Don't break them apart. Melt the butter in the microwave in a microwave safe bowl. (about 30 seconds) Add the other ingredients and stir a bit. Drizzle the butter mixture over the tops of the rolls until completely covered, brushing with a pastry brush to cover the tops evenly. It's ok to let the butter go into the cracks. Sprinkle poppy seeds over all. Cover with foil and place in a 375 degree oven for about 15 minutes.